Text editors allow users to edit and enter text within a web browser. Rich-text editors are essentially web-based WYSIWYG ("what you see is what you get") editors. In this post, I have put together a collection of some of the best, useful and free jQuery Text Editor plugins which are very user friendly and can be easily integrated with minor modifications. These plugins are developed using jQuery. Find out latest and updated list of jQuery rich text editor plugins here. 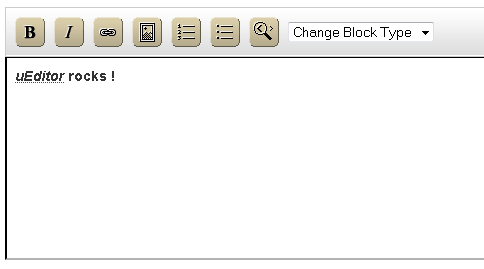 WYMeditor is a web-based WYSIWYM (What You See Is What You Mean) XHTML editor (not WYSIWYG). WYMeditor's main concept is to leave details of the document's visual layout, and to concentrate on its structure and meaning, while trying to give the user as much comfort as possible (at least as WYSIWYG editors). Free and Open Source, fully adaptable to your needs. Most of the browsers are supported. uEditor is flexible and easy to use. As for widgEditor, the generated code is clean and valid (though you should verify it after form submission) and it's possible to use a custom sylesheet for rendering in WYSIWYG mode among other things. JQuery HtmlBox is a modern, cross­browser, interactive, open­source wysiwyg editor built on top of the excellent JQuery library. It is tested with the most widely deployed browsers ­ Mozilla Firefox, SeaMonkey, Microsoft Internet Explorer, Opera, Apple Safari and Google Chrome. The variety of features, and the advanced configuration capabilities, combined with the easy and intuitive setup make HtmlBox as the preferred choice, when interactive user input is required such as in content management systems, forums, guest books, contact forms and others.